As our and other countries slapping rules on FileSharing networks, it has become a nightmare to download other useful files as well. Even I am one among those countless number of people mourning the loss of MegaUpload and lack of access to other FileSharing sites. Torrents are the only source left to download stuff and its annoyingly slow. Also, torrents have always been the heartburn of institutions and organisations and Countries alike, due to hogging of bandwidth. Torrents are deliberately restricted to prevent “plagiarism” and other such copyright stuff. With all this hue and drama, people only have to suffer more than earlier. Bypassing Torrents via proxy is a age-old method, which surely works but is a lot cumbersome to use. Tor is an amazing bundle of software which helps you to browse anonymously. Its hides your IP and allocates another fake IP address. Using Tor, we can access almost all the websites on Public domain, without worrying about your governments rules and limits. Tor can help you bypass IP regulations and help you download torrents anonymously. I was apprehensive before using it first, but it was amazingly very easy and is the coolest method to download torrents. 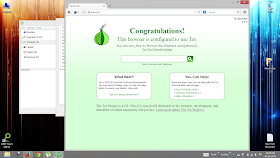 Download : Tor Browser Bundle , the best proxy browser. Torrents are surely slow, but fantastic amount of content can be downloaded via torrents and when every other service is down, torrents are the only option left. Downloading torrents through this method will be a slow but continuous process without breaks. This article focuses only to download torrents anonymously using uTorrent via Tor. Its a very easy 5-Step Set-up and works on all kinds of Internet Connections. Download the Tor Bundle and install. Download the Torrent downloading clientuTorrent from its website. We recommend uTorrent due to its worthiness in downloading all kinds of torrent files. Download the client and install it on your computer. Its small,safe and suave as well! 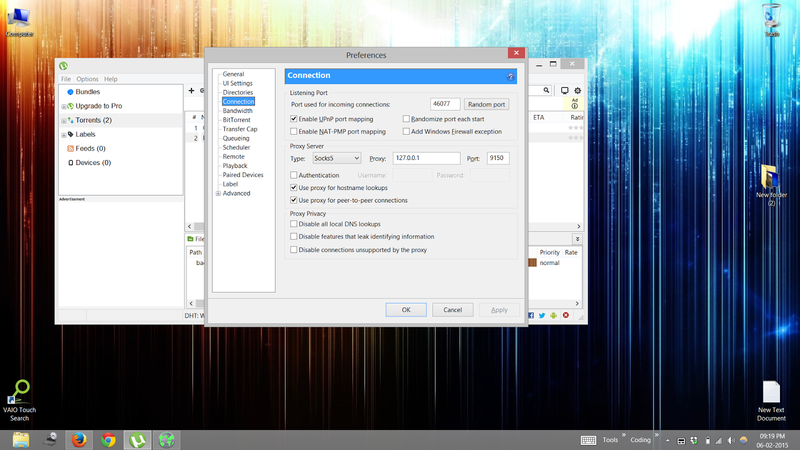 Open the uTorrent software and go toOptions> Preferences (ctrl+P) >Connection and change the settings as shown in the screen shot. Now go to the “Tor Browser” folder you had installed earlier and start the application named “Start Tor Browser“. Starting the browser will allot a proxy address for your machine and you could be ready to browse the web anonymously. 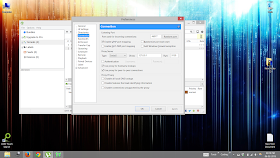 It will open two windows, one is a Browserand other is the Vidalia Control Panel. The browser should Display the Congratulatory message. It will show the message as “Congratulations. Your browser is configured to use Tor.” It will also display the IP number allotted to you. Browsing web in this browser is the perfect method to browse anonymously. Step 5. Having configured uTorrent client and setting up Tor in the background, just visit Torrentz site to search for the content you want, download the corresponding torrent file and double-click the torrent file. Your uTorrent client automatically picks it up and your downloads begin to Start. Your institutions might ban torrent traffic but your PC can still download torrents anytime of the day. This Method works on all kinds of Internet Connections (LAN/ Wi-fi/ Secured/ Unsecured) and it doesn’t have any Pre-Requisites. This method sure works to download torrents, but it isn’t any safe method and makes you vulnerable. Temporary usage of internet on public Wifi networks may work out, but people living under SOPA jurisdiction aren’t much safe. Your IP address is generally made open, and that fact should be feared by many. Enjoy friends....... Like us for more updates.